Fire restrictions | Where can I have a campfire? Senior and Access Interagency Passes are accepted for a 50% discount on single-site camping fees. The Flagstaff Ranger District encompasses nearly 850,000 acres of National Forest lands around the Flagstaff area, from Mormon Lake and Anderson Mesa to north of the San Francisco Peaks. At 12,643 feet, the San Francisco Peaks is not only the dominant feature of the forest area we call the Volcanic Highlands, it's also the highest mountain in Arizona. Three of the summits that ring this dormant volcano's now quiet inner caldera are higher than any other mountain in the state. This mountain is sacred to the native peoples that live in the area and its soaring profile set against a blue Arizona sky serves as a source of awe to contemporary residents and visitors. Views from the summit of the San Francisco Peaks stretch to the Grand Canyon's North Rim over eighty miles away. Hiking, sightseeing, wildlife watching and skiing are the predominant recreation activities enjoyed in this land of mountains, forests and lava flows. Flagstaff Ranger District, extends from north of the Peaks to the south. This rolling highland is a land of ponderosa pine forests and pinyon/juniper woodlands clustered around broad prairies and small lakes. Arizona's largest natural lake, Mormon Lake, is located here. The area is also known for its plentiful wildlife. Large herds of elk roam the forests and edgelands. Bald eagles and ospreys live and hunt around the lakes. Pronghorn antelope graze the prairies. Principal recreation activities among the lakes and prairies are boating, fishing, camping, and wildlife watching. The area also boasts some excellent cross-country skiing in good snow years. The lakes are open year-round. In the warmer months (early May through early October), a fee is required to use the day-use areas, which are managed by a concessionaire. Vist individual sites for details and photos. Upper Lake Mary is the largest of Flagstaff's twin lakes. This long, narrow reservoir is especially popular with power boaters and water skiers because there is no motor size limit on it. It's also popular with those who prefer people-power or windpower over horsepower. For those who like fishing, the lake has northern pike, channel cat, crappie, and some trout. Lower Lake Mary is the smaller of Flagstaff's twin lakes. It has a tendency to disappear during the long dry spells that periodically hit this area. When the lake has water, its banks are usually lined with anglers trying to catch the trout which the Arizona Game and Fish Department stocks here. If it stays full for a year or two, it will pick up a population of northern pike and catfish. There are several other lakes nearby, including Marshall, Ashurst, and Mormon lakes. The Mogollon Rim is a rugged escarpment that forms the southern limit of the Colorado Plateau. It extends across the entire forest and provides excellent views within Plateau Country and Desert Canyon Country as well. Dropping as much as 2,000 feet in some areas, the Rim provides some of the most far-reaching scenery in Arizona. Views stretch from its rocky precipice to Four Peaks of the Mazatzals northeast of Phoenix. Needless to say, sightseeing is a favorite activity along the Rim, but this forest area also boasts a historic system of hiking and horseback trails, a couple of picturesque lakes for boating and fishing, and backcountry skiing for wilderness adventurers. 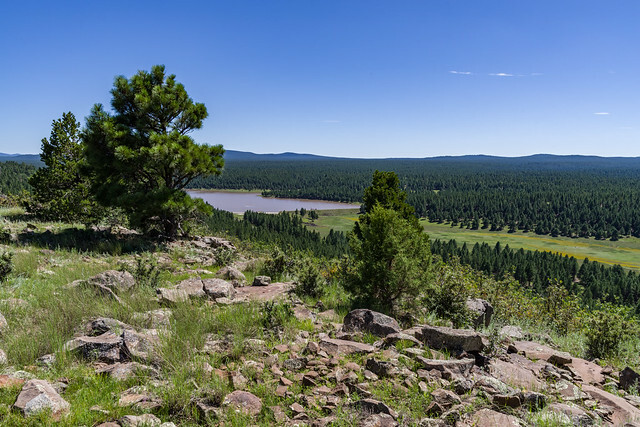 The Mogollon Rim is home to Camp Colley, an outdoor adventure camp at Little Moqui, run by the City of Phoenix, Parks and Recreation. The photo above (see larger view) was taken by Mark Hickcox, Civil Engineer Tech on the Mogollon Rim District, from the Hutch Mountain Lookout Tower in the summer of 2011. It is looking south-east toward Long Lake. The colorful collection of buttes, pinnacles, mesas and canyons surrounding Sedona is famous the world around for its red rock vistas. Over the years, this area has served as the setting of many western novels and movies and has been the subject of uncounted paintings, photographs and other works of art. The remains of ancient wetlands, these crimson cliffs have been carved by the forces of the desert into one of nature's most magnificent masterpieces. No matter what you do in Red Rock Country, you're always sightseeing. Ways to get even closer to all this scenery include: hiking, horseback riding, taking a scenic drive, sliding down a natural waterslide, picnicking, camping, taking lots of photos and fishing in Oak Creek. The Red Rock District includes some 160,000 acres of magnificent splendor. Some areas require a pass to park, so be sure to check out the information about our Red Rock Pass Program. Get the scoop on the Red Rock Ranger District! Oak Creek Canyon is a gorge carved into the edge of the Mogollon Rim of the Colorado Plateau along the Oak Creek Fault. Tectonic forces shifting the land to either side of the fault and subsequent erosion by Oak Creek have created a spectacular canyon where the geologic history of this area is an open book. The Canyon is approximately 12 miles long. Oak Creek flows year-round along the bottom of the Canyon, providing water for plants and wildlife, as well as fishing and swimming opportunities. Oak Creek continues on through Sedona, Arizona, meeting up with the Verde River southeast of Cottonwood, Arizona. The depth of the Canyon ranges from 800 to 2000 feet, with trails providing access from the Canyon’s bottom up to the 6500-foot eastern rim and 7200-foot western rim. Some of these trails follow historic routes early Oak Creek Canyon settlers used to access the top of the plateau in the days before the road was built. Trails on the west side of the Canyon head into Red Rock-Secret Mountain Wilderness. View of the eastern, lava-capped cliffs of Oak Creek Canyon. Approximately 65 million years ago, during a period of great mountain building, movement along Oak Creek Fault caused the east side of what is now Oak Creek Canyon to shift upwards approximately 600 feet. The exposed top rock layers eroded away until the eastern and western sides of the fault were level once again. A few more millions of years passed, and a canyon had formed. Streams carrying gravel, then lava, flowed into the canyon from the north. In the past six million years, the fault became active again and the modern Oak Creek Canyon was carved along it. This time, the fault caused the eastern rim of the Canyon to drop around 700 feet lower than the western rim. One of the best places to get the big picture view of the Canyon’s fascinating geologic history is Oak Creek Vista. The Vista provides a view from the top of the Canyon, where the eastern drop is easily seen. Learn more about the geology of Oak Creek Canyon (U.S. Forest Service).